Many people do not realize that Local Temperature is actually an adware application that displays unreliable third-party advertisements. Therefore, we think, that you should remove this program, provided that your computer has been infected with it. On the outside the program is a weather application, but it is more than that. In reality, the programs primary function is not to show you the weather forecast, but to make money by showing advertisements that are supplied by third parties. so if you are thinking about downloading this application, please read this article and find out why you should not. The publisher of Local Temperature is called Core systems. The program has been developed by a company a company of the same name. Unsurprisingly, there is no further information about the developer. No address, no email, and no phone number. But you can supposedly contact them by seding a message via the application’s website at Localtemperature.net. However, we doubt that you will get a reply. Usually, such things are just for show, and we suspect that this case is no exception. Anyway, the website features two versions of the program. One is an ad-free version with a price tag of $9.99, and a free ad-supported version. Now, we doubt the need to buy such a program since Windows Vista, 7, 8, and 8.1 have built-in weather apps that work rather well, while this application does not. New York City is the default location when you install the program, but we were not able to change the location by entering a city’s name or ZIP code. 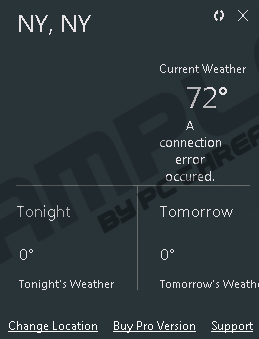 Local Temperature is an application that does not work like it is supposed to. We think there is no need for such a program since during the last decade Microsoft made sure to include such a function in one form or the other. The application collects information about the users and shares it with third parties, and promotes unreliable content that might put your computer’s security at risk. Therefore, we recommend that you remove Local Temperature. Find Local Temperature and click the Remove button. Find Local Temperature and right-click on it. Quick & tested solution for Local Temperature removal.